Thank you for educating our next generation. We’d like to help make your job easier. Nobody spends more time with our children outside of the home than you. You are on the front line and often held responsible for the care of our children. Schools were designed to “educate” and parents were designed to “raise and train” children. However, more often than not, schools are being asked to assume what we believe only parents can do for their children. It’s time to re-balance the scales and shift the burden of care where it rightfully belongs…back to parents and caregivers. We recognize that many parents may not have the proper information, skills, or confidence to become the proactive participant required to raise healthy kids in today’s aggressive culture. That’s where we can help. We’re a parent-driven organization. It’s personal to us. Operation Parent is made up of parents who have gone through and are often going through the same challenges you and your student families face. You can feel comfortable that we’re the right partner for you. We want all of our schools and parents to know they are not alone on this journey, but rather part of a community that understands the ups and downs inherent in parenting school age children. How do we educate parents? It starts with our Parent Handbook. Drugs and alcohol are very important issues to parents but oftentimes parents miss the underlying problems that fuel their child’s substance abuse…anxiety, bullying, depression, dating violence, divorce, etc. 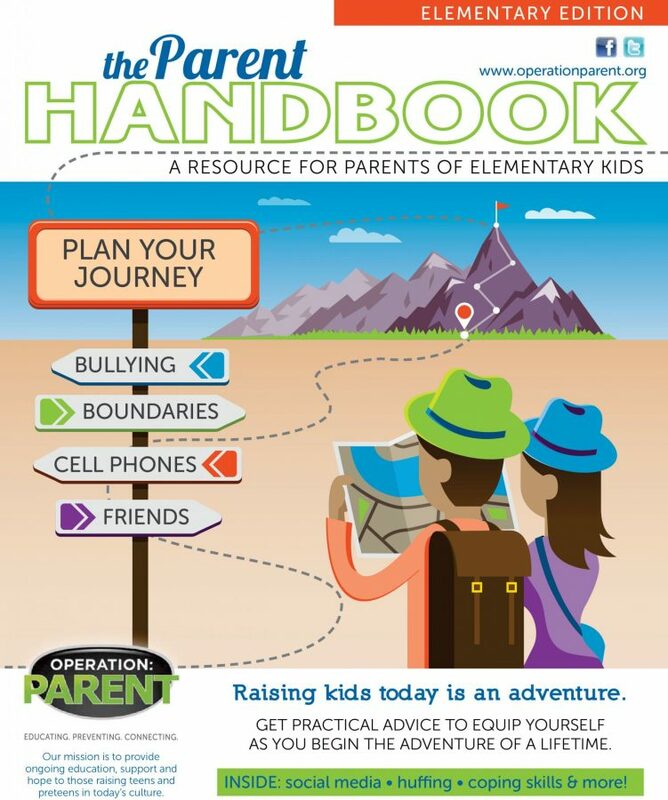 Our parent handbook helps parents raise their awareness and begin connecting the dots so lives can be saved and prevention can take root. Your school can foster a proactive approach when you place a parent handbook in the hands of every 4th, 6th and 9th grader. Reinforce with a “Community Presentation”. Operation Parent has been providing engaging and practical school presentations to parents for the past eight years. Let us come to your school and speak to parents about social media, cyberbullying, drugs and alcohol, the developing teen brain and other topics covered in our Parent Handbook. Student presentations are also available. Keep it going with webinars, videos and social media. Parents are busy and the teen and preteen culture is continually changing. For this reason, we continue to update our information and deliver it to parents 24-7 using webinars, videos and social media. Operation Parent can provide the ongoing education your parents need throughout elementary, middle and high school. What if your child is the kid who bullies?